This is one excellent tour de force of a thriller. Red herrings, twists, crossings and double-crossings – this story has them all, even twists that are so twisted that some of them become double switchbacks. You never really get a complete grip on what is going on – the plot moves too fast and every character is too slippery and untrustworthy to get a handle on and most of them are unsavoury as well, leading you to mistrust even the most innocent-seeming characters. The style is clipped and to the point and the plot just as hard-boiled as in Red Harvest, which it resembles in that it shows a small city in the grip of criminal gangs. Only here there is no tough Continental Op to clean up the town; there is only Ned Beaumont who is a criminal himself, one whose whim (and possibly loyalty to a friend, although I have my doubts about that) leads him to investigate the murder and whose apparent weakness – he is not a fighter and hardly defends himself when attacked – leads people to underestimate what he is capable of doing by pure cunning. Rating: One of the classics of the genre. 4+ stars. 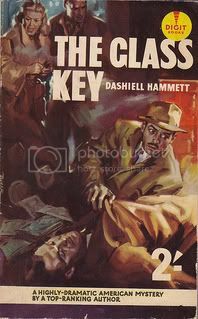 Some have argued this is Hammett's best book. I think RED HARVEST is better, but THE GLASS KEY is right up there. For the genre - I love the Coen Brothers adaptation of the Glass Key as the basis for "Miller's Crossing". They changed quite a bit, but the overall film is brilliant and my favorite Coen Bros. and gangster film hands down.